June Gordon, Marchioness of Aberdeen, was a dedicated amateur conductor, and Haddo House, her home, was the setting for many musical performances. 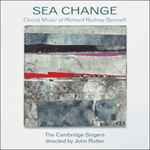 Puer nobis, written at her request for a carol concert, is frankly retrospective in style, recalling with warmth and fondness the best of Stanford’s part-songs but still bearing Bennett’s own distinctive stamp. Is still the little welcome Son. And He too, Whom we have by heart.